A thread for sharing and discussing games that look intriguing and aren't necessarily mainstream. Currently 1v1 - one player is a sniper and the other is a spy and each of them have to use psychological and other cues: the spy to remain hidden, subtle, and to blend in with a fancy cocktail party while accomplishing a list of spy tasks, and the sniper to identify the spy based on behavior to take out the target. Seems intriguing! Spy Party looks awesome. It's been on my radar for a little while now, mostly I'm waiting for it to not be in early access (I burn myself out of half-finished games when I buy EA, so trying to hold off). This style of gameplay reminds me of the EXCELLENT multiplayer in Assassins Creed Brotherhood, where players had to assassinate other players while blending in with hundreds of NPCs. There's so much strategy in blending in and acting like you're part of the crowd while trying to do an objective. It creates a special type of tension and fear that I absolutely love experiencing in games. It's a great gameplay style and wish more multiplayer games had it. The addition of a sniper to that mechanic is so cool. And the Spy has to do numerous tasks among the party, so it's not just a one and done, increasing the chance for exposure. It sounds SUPER intense. I'm down to play this with people, looks fun. I think this is another fantastic, lesser-known game. Played this quite a few times with @Ilriyas, it's a total blast. Highly recommended even if you've got friends to play with. Great music too. 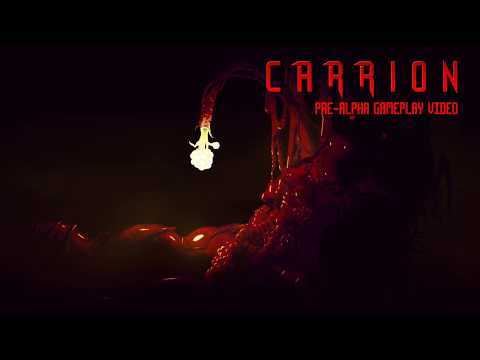 Carrion is a new game being made by the studio that did Butcher. It's a reverse-horror game where you play as a terrifying monster in what feels like a late 80's sci-fi horror film. You move around the levels, solve puzzles, gain powerups, grow in size, and kill terrified humans in the most creepy and horrible ways possible. There's very little info on the game currently available outside of this pre-alpha demo video, but what's in there is pretty darn interesting and looks like it could be a very uniquely fun game, in a creepy, gross-out kind of way. I really enjoyed the Assassin's Creed multiplayer, it looks to be a game built entirely around that similar to SpyParty in that its hunter vs hunted but with up to 8 people all playing at once. Could make for a fun party game with more actors and therefore potential for Icrontic game nights than the two player nature of SpyParty. That said I'd be down to play either.